Shirts With Random Triangles: Paul Rhoads FIred, Is An Ex-Iowa St. Coach. Paul Rhoads. Image via The Ames Tribune. Paul Rhoads is an ex-head coach. 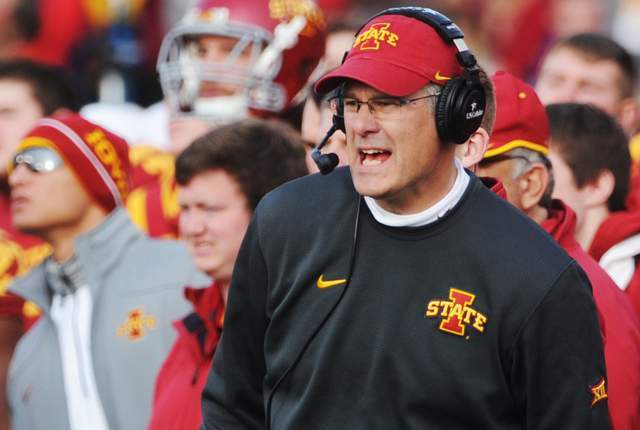 Iowa State announced on Sunday that it had fired Rhoads after seven seasons as head coach of the Cyclones. Rhoads went 32-54 at Iowa St., his first head coaching job. His only winning season as head coach was his first one in 2009. The Cyclones went to three bowl games under Rhodes, going 1-2. The move comes a day after Iowa St. lost to Kansas State 38-35. And yes, the suggesting of bringing Gene Chizik back to Iowa St. has been made. Rhoads replaced the current North Carolina defensive coordinator as head coach of the Cyclones following Chizik's departure to become head coach of Auburn in 2009.